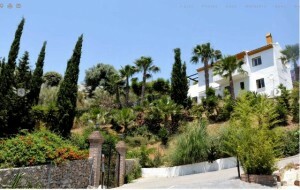 Villa Los Balcones is located on the popular development of Cortijo Romero, which is on mains services and has good tarmac access and street lighting. The villa is on two levels and located only a twenty minute drive from the Mediterranean Beaches, 5 minutes from Lake Vinuela and a fifteen minute drive to the beautiful National Park of Alcaucin. The property is fully walled, secure with metal entrance gates and parking. The established gardens, with palm trees and other succulents are low maintenance. The 8 x4 pool is located on the lower level with stunning south facing views to the surrounding mountains. Inside the villa there is a large open plan lounge/diner/kitchen area with patio doors on to a small dining terrace, with retractable awnings. The lounge/diner is very light with lots of windows to enjoy the views, there is a built in wood burner and there are ceiling fans throughout. Just off the main living area is the fully equipped American style kitchen, with breakfast bar and electric appliances. There are three good size bedrooms with ceiling fans, and fitted wardrobes, the master bedroom has its own en-suite bathroom that is newly reformed and the two other bedrooms share a good size family bathroom with neutral tiles . This villa is fully established and ready to move in to. A fantastic location and suitable as a lovely family home or holiday home.